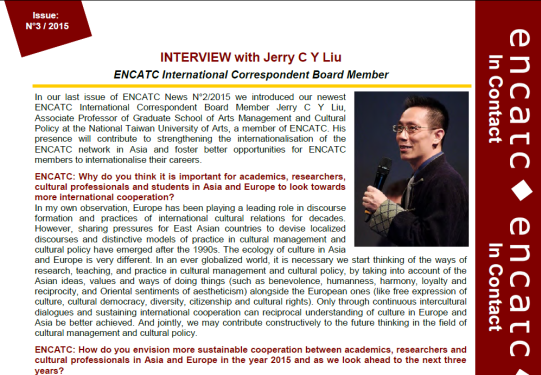 In our last issue of ENCATC News N°2/2015 we introduced our newest ENCATC International Correspondent Board Member Jerry C Y Liu, Associate Professor of Graduate School of Arts Management and Cultural Policy at the National Taiwan University of Arts, a member of ENCATC. His presence will contribute to strengthening the internationalisation of the ENCATC network in Asia and foster better opportunities for ENCATC members to internationalise their careers. ENCATC: Why do you think it is important for academics, researchers, cultural professionals and students in Asia and Europe to look towards more international cooperation? In my own observation, Europe has been playing a leading role in discourse formation and practices of international cultural relations for decades. However, sharing pressures for East Asian countries to devise localized discourses and distinctive models of practice in cultural management and cultural policy have emerged after the 1990s. The ecology of culture in Asia and Europe is very different. In an ever globalized world, it is necessary we start thinking of the ways of research, teaching, and practice in cultural management and cultural policy, by taking into account of the Asian ideas, values and ways of doing things (such as benevolence, humanness, harmony, loyalty and reciprocity, and Oriental sentiments of aestheticism) alongside the European ones (like free expression of culture, cultural democracy, diversity, citizenship and cultural rights). Only through continuous intercultural dialogues and sustaining international cooperation can reciprocal understanding of culture in Europe and Asia be better achieved. And jointly, we may contribute constructively to the future thinking in the field of cultural management and cultural policy. ENCATC: How do you envision more sustainable cooperation between academics, researchers and cultural professionals in Asia and Europe in the year 2015 and as we look ahead to the next three years? The collaboration of 2015 International Symposium on Cultural Trajectories, and the 5th ENCATC ACADEMY: International Cultural Relations: New Initiatives in Taiwan, East Asia and Europe, which are to be held on November 13 to 15 in Taipei will be a good start. I am sure, continuous exchanges and networking through formal institutional cooperation schemes, conference, workshops, seminars, symposiums and visiting tours between Asia and Europe will be further explored. I personally would be most happy to see more cooperation and collaboration occur between ENCATC, National Taiwan University of Arts, Taiwan Association of Cultural Policy Studies, ANCER, as well as cultural institutions between all European and East Asian countries. The NTUA and TACPS may host researchers and exchange MA and Ph D researchers for Asian visits and joint research projects. With the sharing goals and joint efforts, a new Global Network of Cultural Policy and Cultural Management can even be conceived in the 3 or 5 years to come. Of course, this would require sustaining mutual inputs of human and fiscal resources. ENCATC: As an International Correspondent Board member, how will you contribute to reinforcing synergies between colleagues in Asia and Europe? As an International Correspondent ENCATC Board member, and the same time a teaching staff in the National Taiwan University of Arts, the President of Taiwan Association of Cultural Policy Studies, a representative member ANCER of the NTUA, my colleagues and I may serve as a bridge to reinforce the exchange of European and Asian cultural management and policy studies. For years, we have already been working hard to create networks among scholars and practitioners of cultural policy in East Asian countries and beyond, especially with Japan, China, Korea, Hong Kong, Singapore, Europe and USA. The annual International Symposium on Cultural Trajectories in Taipei has come to its 9th year. Now, it attracts 70-80 paper submissions and hundreds of cultural experts, scholars and participants yearly. Conference proceedings and books on arts management and cultural policy studies are published, and regular national and international cultural seminars, forums are held monthly. We will keep collaborating and exchanging closely with researchers, scholars, cultural practitioners and policy makers from above Asian cultural institutions. ENCATC is the key European network on cultural policy and cultural management. Asian participation in ENCATC allows our research results to be seen, commented, and voices in Asia to be heard and responded to in Europe. Vice versa, taking part in Asian events would extend ENCATC members’ international influences, and provide European colleagues a realistic site to see, feel, monitor and understand how Asian practitioners interact, operate, and organize their networks on cultural policy and management. ENCATC: Based on your international work experience what are some of the challenges and obstacles you’ve encountered with European/Asian collaborations? There are very different cultural contexts, value orientations, modes of interactions and ways of relation keeping in Europe and Asia. In East Asia, cultural practitioners are trying hard to seek critical, yet compatible, strategies to incorporate the capitalist ethos or entrepreneurial spirit of profit-making, risktaking and creativity in the newly emerging cultural entrepreneurship. Yet the linguistic barriers, travel costs, uneven flows of exchange students, and unbalanced economic development and cultural relations between European and Asian academics and institutions all pose challenges to European/Asian collaborations. ENCATC: Do you have any suggestions for overcoming such challenges? There is no short-cut in overcoming intercultural obstacles. Continuous Euro-Asian cultural dialogues and exchanges in the field of cultural management and cultural policy helps. Investment in linguistic and cultural translation may enhance mobility. And long lasting intercultural networks with positive engagement and collaboration among international educators, researchers, students, policymakers, cultural managers and operators will also assist to overcome such challenges. However, a fundamental change of mind-set and strategy for a reciprocal cultural collaboration will be critical to the development of positive cultural relations between Asia and Europe. ENCATC: Are you currently working on or have any upcoming research, activities or projects that could be interesting for ENCATC members? My current research on the ReOrient of cultural governance and cultural policy: the interactivity between culture and political economy in international cultural relations; the underlying cultural logics of Asian and European cultural strategies through a macro-historical approach; the mapping of cultural rights, cultural networks and cultural public sphere in Taiwan could be of some interest to ENCATC members. My experiences of working as a contract columnist for the United Daily News in Taiwan, consulting member for the drafting of Culture Basic Law, and the Global Outreach Office of Ministry of Culture in Taiwan may also be interesting for the European colleagues. ENCATC: On 16 May of this year, as President of the Taiwan Association of Cultural Policy Studies you were part of an important landmark event for cultural policy in Taiwan. Could you please explain? May 16th of 2015 is a historical date for cultural public sphere in Taiwan. On that day, 34 artists, cultural practitioners and academics assembled and announced the inauguration of the Taiwan Association of Cultural Policy Studies (TACPS). TACPS is an autonomous and not-for-profit legal organization. Members of TACPS come across a wide range of disciplines – from cultural policy, arts management,cultural heritage, performing arts, visual arts, art critics, community regeneration, cultural and creative industries, arts market, cultural economy, film and media studies, popular music, to international cultural relations. The mission of TACPS is to create an open and accessible knowledge sharing platform, and to develop a public sphere that would facilitate cultural collaborations, dialogues, engagements and rational debates among different agents, including academia, NPOs, cultural enterprises, creative industries and governmental cultural institutions in Taiwan and abroad. Since the 1990s, Taiwanese artists, academics, and cultural practitioners in art-cultural foundations and NGOs have been engaging actively and positively in public cultural affairs. Policy makers in Taiwan are making their attempts to devise localized discourses and models of practice in cultural policy, industries, and citizens’ engagement in public cultural sphere. Nevertheless, pubic cultural sectors (including City Cultural Bureaus and the newly established Ministry of Culture in 2012) are unable to integrate and allocate the already limited cultural resources to meet the expectation of citizens. For a decade, the government failed to provide a clear mid-term and long-term cultural strategy for the state and city. One of the key reasons is the lack of consistent and persistent ground research on cultural policies and open accesses for citizens to participate fully in cultural policy making. The founding of TACPS represents the rise of an independent, professional, yet grassroots, think-tank of the third sector for Taiwan’s cultural policy research. TACPS is dedicated to informing policies that may cast impacts upon cultural governance in Taiwan. Based on socially embedded and in-depth research, it will also play a critical role in monitoring and evaluating governmental cultural policy practices in the form of public forums, rigorous intellectual debates and media influences. TACPS provides a platform for scholars, artists and cultural practitioners to exchange their works, experiences and ideas across disciplinary lines and institutional positions for capacity building. What is needed in Taiwanese society at present is probably a “gestalt-switch,” a fundamental change of worldview, mind-set, or an informing spirit of core values for an active reform of cultural governance. Driven by the principles of autonomy, flexibility, inclusiveness, and plurality, TACPS strives to bring about an emerging model of cultural policy with Taiwanese characteristics via a bottom-up approach. It expects to connect Taiwanese cultural policy studies with the East Asian, American, European, and global networks.